Scientific management, also called Taylorism is a theory of management that analyzes and synthesizes workflows. Much is said about scientific management of work. It is a narrow view which restricts the science which secures efficiency of operation to movements of the muscles. The chief opportunity for science is the discovery of the relations of a man to his work — including his relations to others who take part — which will enlist his intelligent interest in what he is doing. Efficiency in production often demands division of labor. But it is reduced to mechanical routine unless workers see the technical, intellectual, and social relationships involved in what they do, and engage in their work because of the motivation furnished by such perceptions. The tendency to reduce such things as efficiency of activity and scientific management to purely technical externals is evidence of the one-sided stimulation of thought given to those in control of industry — those who supply its aims. Because of their lack of all-round and well-balanced social interest, there is not sufficient stimulus for attention to the human factors and relationships in industry. Intelligence is narrowed to the factors concerned with technical production and marketing of goods. No doubt, a very acute and intense intelligence in these narrow lines can be developed, but the failure to take into account the significant social factors means none the less an absence of mind, and a corresponding distortion of emotional life. Frederick W. Taylor was the first man in recorded history who deemed work deserving of systematic observation and study. On Taylor's 'scientific management' rests, above all, the tremendous surge of affluence in the last seventy-five years which has lifted the working masses in the developed countries well above any level recorded before, even for the well-to-do. Taylor, though the Isaac Newton (or perhaps the Archimedes) of the science of work, laid only first foundations, however. Not much has been added to them since – even though he has been dead all of sixty years. By the time of Frederick Winslow Taylor's death, the gospel of industrial efficiency preached by American scientific managers was commonplace on both sides of the Atlantic. In the following years of world war, reconstruction, and adjustment, scientific management attracted a new generation of advocates and practitioners, many of whom would have perplexed and shocked Taylor and his immediate circle. Of the entrepreneurs of scientific management who succeeded Frank Gilbreth, Harrington Emerson, Richard Feiss, and other pioneers, none was more successful than Charles Eugene Bedaux (1886-1944). Unlike Tay­lor and his colleagues, Bedaux was and still is a mysterious figure. Secretive to a fault, he avoided professional contacts, refused to write for popular or technical journals, and spurned publicity. Yet he was a master salesman whose operations were global in scope and impact. Only in recent years, with the discovery of the papers of the British Bedaux Company, is it possible to gauge the impact of Bedaux and his extraordinary career. Steven Kreis, "The diffusion of scientific management: the Bedaux company in America and Britain, 1926-1945." A Mental Revolution: Scientific Management and Taylor (1992): 156-74. With the triumph of scientific management, unions would have nothing left to do, and they would have been cleansed of their most evil feature: the restriction of output. To underscore this idea, Taylor fashioned the myth that 'there has never been a strike of men working under scientific management', trying to give it credibility by constant repetition. In similar fashion he incessantly linked his proposals to shorter hours of work, without bothering to produce evidence of "Taylorized" firms that reduced working hours, and he revised his famous tale of Schmidt carrying pig iron at Bethlehem Steel at least three times, obscuring some aspects of his study and stressing others, so that each successive version made Schmidt's exertions more impressive, more voluntary and more rewarding to him than the last. Unlike Harrington Emerson, Taylor was not a charlatan, but his ideological message required the suppression of all evidence of worker's dissent, of coercion, or of any human motives or aspirations other than those his vision of progress could encompass. We never had any use for Taylor nor any of the efficiency or scientific management crowd. They never realized that human toil was the last thing in the world you had to be efficient about; the only way to be really efficient is to eliminate it entirely, and this would have been heresy to any of the Taylor, Gant, Barth, Cook efficiency crowd. It is sad to contemplate that men of the technical ability of the names mentioned in this paragraph were so lame in their thinking and social outlook that they missed the boat so completely. Who in hell wants to be efficient with a shovel, and what sense would there be even if you succeeded? They should have had their heads opened with a shovel, it might have been more effective. 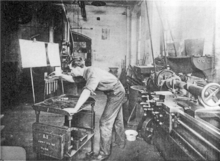 When Taylor began his efforts at the Midvale Steel Company in the 1880s, several members of the American Society of Mechanical Engineers were likewise interested in labor management. Industrial capitalism was running up against renewed resistance from the growing ranks of labor, still committed to a sense of work integrity and craftsmanship. Task management, or scientific management as it came to be called, began to take shape in the eighties as the way to break the worker's threatening resistance. The heart of this approach is the systematic reduction of work into discrete, routinized tasks, totally separated from any policy decisions about the job. 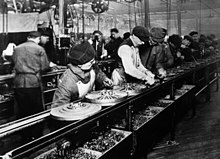 ... For capitalism to be firmly in control, it must monopolize information and techniques as surely as it controls the rest of the means of production. The worker must be permitted only to perform certain specific narrow tasks as planned by management. Despite the pseudo-scientific apologies for the Taylorist approach, the public readily developed a very negative view of it. As the Taylor Society admitted with surprising candor, scientific management was widely seen as "the degradation of workmen into obedient oxen under the direction of a small body of experts—into men debarred from creative participation in their work." Commons provided the cardinal reason for the unions' absence of hostility to Taylorism: "... the unions have generally come to the point of confining their attention to wages — that is, to distribution — leaving to employers the question of production." ... The "management's rights" clause found in every U.S. union contract ... vests the sole right to set work methods, job design, assignments, etc. with management. ... In fact, well before the War the idea began spreading that unionization, with its standard "management's rights" clause contracts, was the best approach for fitting the Taylorist yoke on the workers. The efficacy of this "trojan horse" tactic of union mediation led Thompson to prescribe industrial unionism over the AFL's craft unionism as the best way the secure the Taylor system in industry.